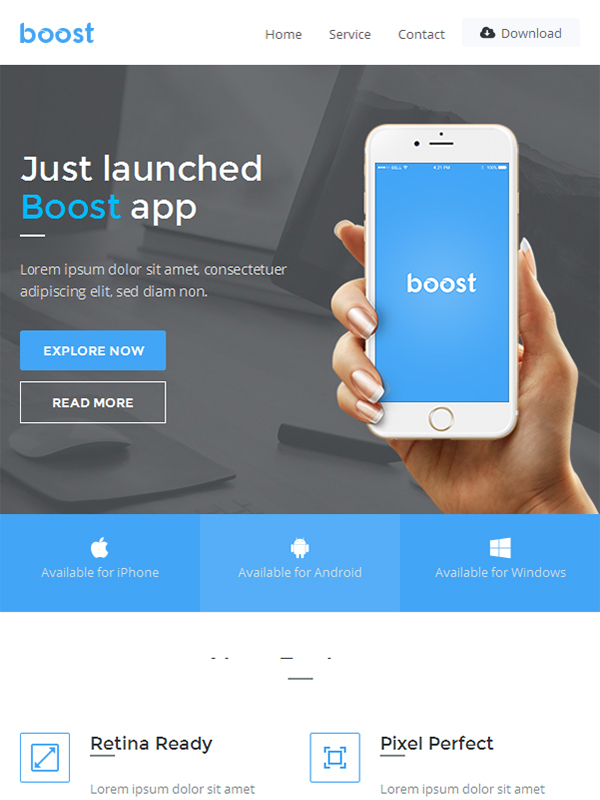 Boost is an email template package that contains templates that are ideal for the promotion of mobile apps. You can choose among several template layouts that are provided. Alternatively, you can also edit an existing email template or create a new one. The prowess of email marketing is well-known and a template like this will help you realize the true potential of emails for app promotion. The templates are not only attractive and engaging but are also designed in a way to convey maximum information without making the layout appear congested or cluttered. Additionally, the template is purely responsive and compatible with all major email clients and service providers. You get access to a free email template builder tool that can be used to edit existing templates as well as create new ones using simple drag and drop operation. MailChimp is one of the most used email service providers and our Boost app promotion template fully supports all the features of MailChimp. In order to effectively monitor your email campaigns, you require Campaign Monitor tool and our template is compatible with it. My Mail is another email service provider which is in common usage. 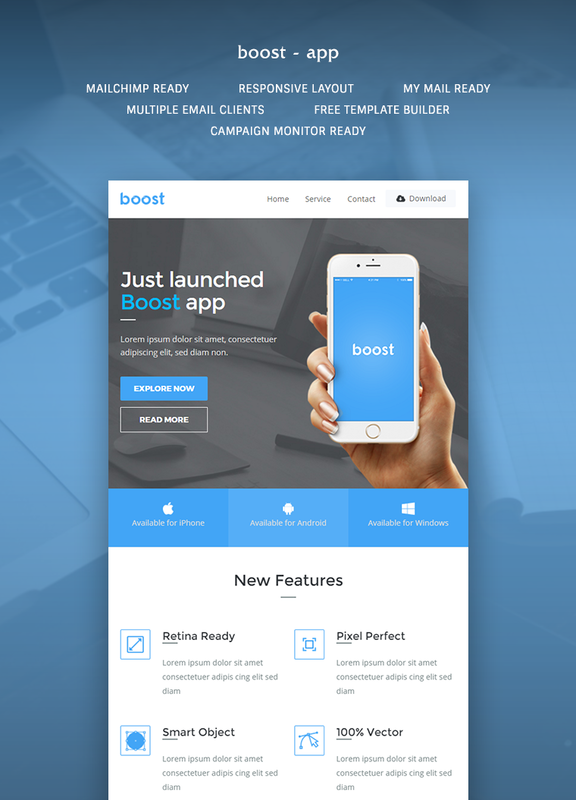 Boost app promotion template supports all the features of this tool and performs all its functions. Being one of the most sough after features, responsive layout is a must in all email templates and Boost newsletter template is a truly responsive template. From Yahoo mail and Hotmail to native Android mail and Gmail app, our email template is displayed sharply on all major email clients- apps and browsers. The email template by theem™on comes with a drag and drop email template builder and therefore, does not require much effort for editing an existing template or create a new one. With a plethora of features, the template can assist you in highly effective and impactful email campaign. Set background image for most email clients. Layered and organized PSDs included. In order to keep Boost app promotional email template free from all bugs and errors and ensure top-notch performance, we use hand-coded markups, eliminating any garbage coding. Although the email template is designed for app email promotion, the availability of the template builder tool, make the template versatile. With slight modifications, the template becomes multipurpose. If the users face any issues while editing or using Boost email template, we have provided clear documentation that will help the users identify the problems and get a solution instantly. The template is user-friendly both for the email marketers in terms of deployment and end users who can also interact with certain features of the template and get their response registered. Litmus test is conducted for email templates in order to assess their compatibility with the email clients. theem’on makes sure that Boost app email template are litmus tested for assured compatibility. We provide prompt technical support and assistance to our clients who buy our templates. We make sure that you query is resolved in the least possible time by the expert professionals.